Today is Equal Pay Day, a reminder that a significant pay gap still exists between men and women in our country. At the median in 2013, a woman working full-time, full year was paid only 78.3% of what a man working full-time, full-year earned. Equal Pay Day is April 14 because it marks how far into the next year women would have to work to earn the same amount that men earned in the previous year. But while comparing median full-time, full-year workers is interesting, it is also worth looking at what the wage gap looks like at different points of the male and female hourly wage distributions. Last week, I looked at the pay gap throughout the wage distribution, and found that the gap was highest at the top. Women at the bottom 10th percentile of earners made 91 percent of men’s hourly wages. At the median, women earn 83 percent of men’s hourly wages. But at the 95th percentile, women earn only 79 percent of men’s wages. We can also look at gender wage gaps by education level. The figure below shows the gender wage gaps at several levels of educational attainment. Even among the most educated workers—those with an advanced degree—large wage-gaps persist, with women making only 74 percent of men’s hourly wages. 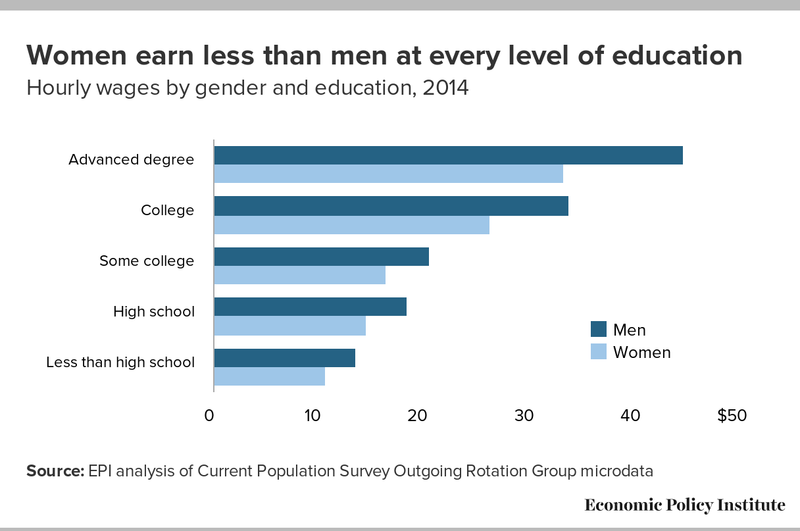 For those with a college degree, women make about 78 percent of male earnings. Although women have come a long way in terms of equality and the gender pay gap since the Equal Pay Act was signed in 1963, there is still a long way to go. Even (and sometimes especially) among the most educated and highest-earning women, significant wage gaps remain. One of the agenda items of our initiative to Raise America’s Pay is to end discriminatory practices that contribute to such gender inequalities. We need consistently strong enforcement of antidiscrimination laws in the hiring, promotion, and pay of women and minority workers. This includes greater transparency in the ways these decisions are made and ensuring that the processes available for workers to pursue any violation of their rights are effective. Wage gaps between men and women are one more way that the rules of the American labor market short changes too many working families.